Jeff was born in Davenport, Iowa in 1962. He attended the Georgia Institute of Technology where he studied Architecture and Civil Engineering, culminating in a Master of Civil Engineering degree. He has worked as a Civil Engineer for 20 years in both the public and private sector, and presently serves as the City Engineer for the City of Norcross, Georgia. 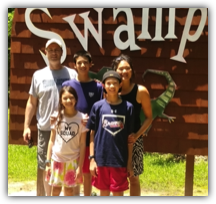 Jeff has been married for 25 years to Jessica Mueller and has two college-aged children, Leslie and Henry, who thoroughly enjoyed The Swamp during their teen years. Jeff graduated from the University of Tennessee with a degree in Economics in 1984, then worked in the insurance industry and financial services in various capacities until entering the full-time ministry with his wife Ashley in 1994. They served the church in Nashville, led the church in Memphis, and then ultimately were called to serve in Atlanta in late 1996, where they served the members in the southern part of Atlanta until 2004. Jeff served on the board of Faith Fellowship Christian Church (now Atlanta Metropolitan Christian Church) while living in McDonough, GA. Since moving to Marietta, Georgia, Jeff and his family are part of the North River Church of Christ. Jeff has been married to Ashley for 18 years and they have two teenage children together, Kennedy and Sydney, who are both raving fans of The Swamp. In addition, Jeff also has a daughter, Hilary, who is a junior opera major at the University of Tennessee. Jeff holds the position of Executive Director with LegalShield. He specializes in offering legal plans and identity theft protection to employers and employees all over the southeast. Jeff is also an active real estate investor in the Cobb, Douglas, and Paulding county areas. Kevin is currently a Managing Principal in the Atlanta office of Sullivan, Cotter, and Associates, Inc., a healthcare consulting firm specializing in executive and provider compensation strategies. Kevin serves as the Physician Services Practice Leader, with deep expertise in physician integration, physician enterprise optimization, and compensation and FMV assessments. Kevin has a degree in economics from Millikin University and a Master of Business Administration from Georgia State University. His family includes his wife, Manda, and two children, Alex and Katie. Kevin and his family all love attending The Swamp and are honored to serve this ministry. Sullivan, Cotter, & Associates, Inc.
Isaac was born in South Korea, but grew up in Memphis, Tennessee. He graduated Georgia State University with a degree in Criminal Justice. Isaac started his career as a Police Officer for the City of Decatur in Georgia. In 2001, he began his career with State Farm and has been there for 18 years. His current position is a Learning Delivery Facilitator. Isaac has been married to Jamie for 18 years and they have 3 sons: Sam (14), Nathan (9), and Eli (8). Isaac and his family are part of the Cornerstone Church of Christ in Duluth, Georgia. He is excited about serving this ministry and building memories for our youth for years to come. Rachel grew up in Athens, Georgia and earned her undergraduate (ABJ in telecommunications) and law degrees at the University of Georgia. She moved to Atlanta with husband Derrick in 1995 to start their careers and a family. After a short stint in litigation, Rachel began working in-house with a Real Estate Investment Trust. She left the workforce in the early 2000s to raise their young children, and went back to commercial real estate in the 2010s in partnership with Derrick. She handles acquisitions, dispositions, and investment management for residential and commercial properties throughout the southeast. Rachel and Derrick have lived in Marietta, Georgia since 1995. They served in the campus ministry at UGA, and are actively involved in the children’s ministry and Building Advisory Committee at North River church of Christ. Rachel has been married to Derrick for 24 years and they have three children – Kayla (18), Hunter (16) and Mya (12). Family Camp is their favorite and the Blooms been going since its inception in 2006. DRB Investments, LLC and Myhuka, Inc.
Glenna E.L. Boston is a 2014 graduate of North Carolina Central University School of Law and licensed attorney for the state of North Carolina. Prior to attending law school, Glenna served as a child protective service social worker and therapeutic mental health social worker. Her social work practice inspired her to attend law school. During law school she founded a project recognized by the North Carolina State Bar. Glenna’s primary practice involves Abuse and Neglect of children and representation of Mental Health professionals in protecting their records. She serves as part-time faculty at North Carolina State University teaching social welfare policy history classes. Glenna holds a Bachelor of Social Work and is a North Carolina Child Welfare Collaborative Scholar from North Carolina State University. She has served as a board of director for the National Association of Social Workers of North Carolina, Durham Public Schools Site-Base Committee, Durham Public Truancy Judge, and held office for the Board of Directors for a North Carolina charter school. Glenna’s proudest accomplishments are her children, Ameliya and Mekhi, and husband, Deric, of almost twenty-four years. Her daughter Ameliya has participated in Swamp Corps annually since 2015 serving in four different countries. Glenna has devoted her entire professional career to speaking for those who cannot speak for themselves and advocating for all to speak up and be judged fairly. Mark grew up in a small town in northern Indiana and attended Purdue University where he earned a BS degree in electrical engineering in 1989. He began his career at Motorola and has worked the last 14 years for Qorvo in Greensboro, NC as a design engineer specializing in radio frequency module integration for cell phones. He and his wife Jenn have been married 27 years and are members of the Piedmont Triad Church in Greensboro, NC. Their boys loved going to Swamp each summer when they were younger and Mark and Jenn have also enjoyed volunteering in the kitchen for a week during the summer for the past seven years. They love helping Camp Swamp do what it does. Crystal, a native of Georgia, attended Emory University and The University of Georgia School of Law. She practiced administrative law for several years before joining the HOPE for Children, Inc. staff in 1996. She then began a life-long love of service to children around the world. She began aiding development of HOPE's international adoption arm becoming Program Director, International Programs Director, and finally serving as Interim Executive Director before her retirement to private practice and motherhood. Crystal has also served the State of Georgia in the child support recovery program under the Special State Attorney General's office. In addition, she has maintained her own private practice specializing in private international and domestic adoption. She is wife of Kevin Payne and together they have 3 children, Chandler, Carter and Ashley, all three who love and treasure their experiences at camp.